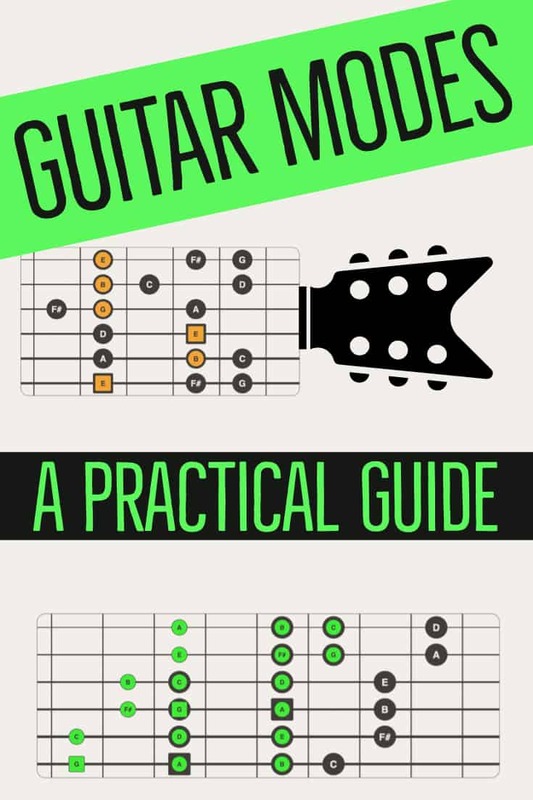 Whenever I see guitar modes explained in lessons and other guitar blogs, there always seems to be one key point missing. How they overlap each other. 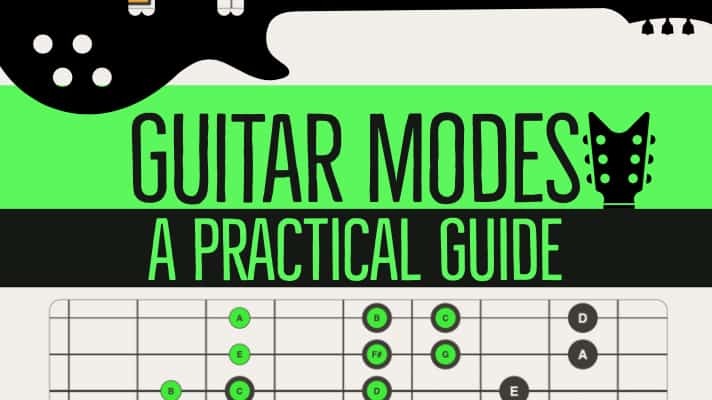 When discussing how to use guitar modes, it’s really important to understand how they fall across the fretboard in any given key. 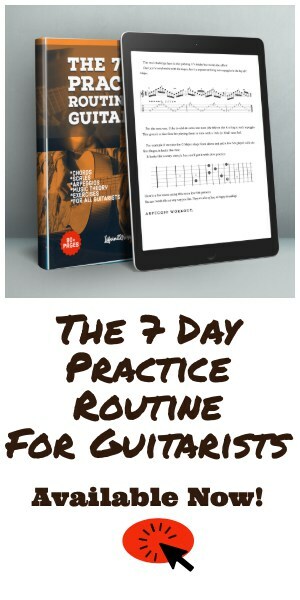 To further illustrate this point, I received an email from Randal, an email subscriber who had just purchased my book The 7 Day Practice Routine For Guitarists. Randal said his guitar teacher had shown him modal scales in the old style block forms and wondered why I taught them as 3-note-per-string-shapes. If you’re completely new to modes and want to see how they are constructed from scratch, check out my Intro to Guitar Modal Scales Lesson and workout. Block shapes with Chord Forms. Block shapes vs. 3 Note-Per-String Guitar Mode Shapes. Using GuitarLayer Software for this lesson. Up one scale, down the next. Before we get into the bigger shapes, it’s worth mentioning that these block shapes are perfectly fine and useful guitar mode shapes. In fact, I believe there is some benefit to learning both. Let’s look at the old-school block style modal shapes in order in the key of G Major (G A B C D E F# G). The thing I like about these shapes is that you can clearly see the chord form for each within the block shape. This is handy, as it allows you to get both under you fingers right away. 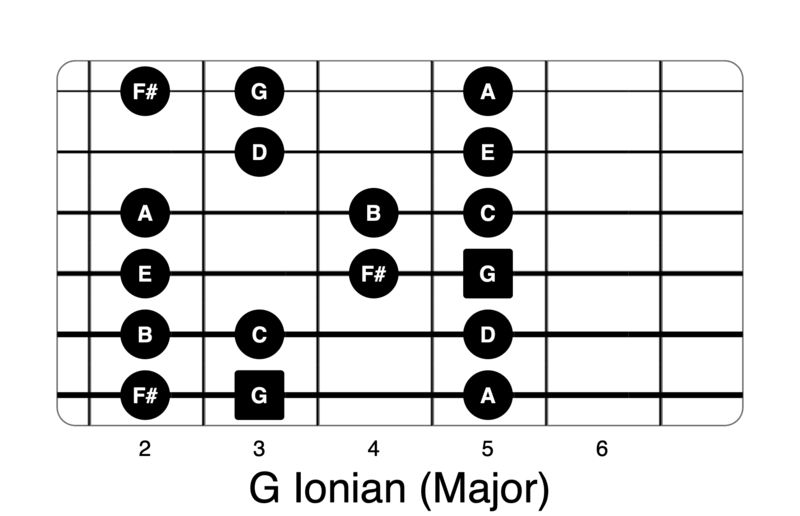 Remember that Ionian is just another name for a plain old Major Scale. The 2nd degree A, includes a minor chord form. Dorian is a popular minor mode often used by Carlos Santana among others. The 3rd degree, also a minor chord on the B root. Phrygian is a cool sounding mode when you’re trying to get a dark, almost Spanish sound. C Lydian with a C Major chord. Lydian is a great mode that exploits the b5 (#11) sound and is widely used by guitarists such as Steve Vai and Joe Satriani. D Mixolydian with a D Major chord. 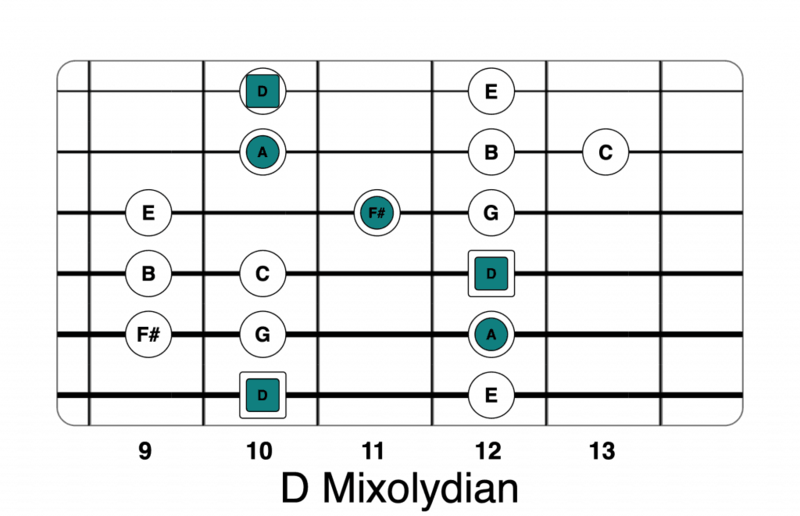 Mixolydian works great over dominant 7th and 9ths. Try this scale over a D7 or D9 chord or backing track. 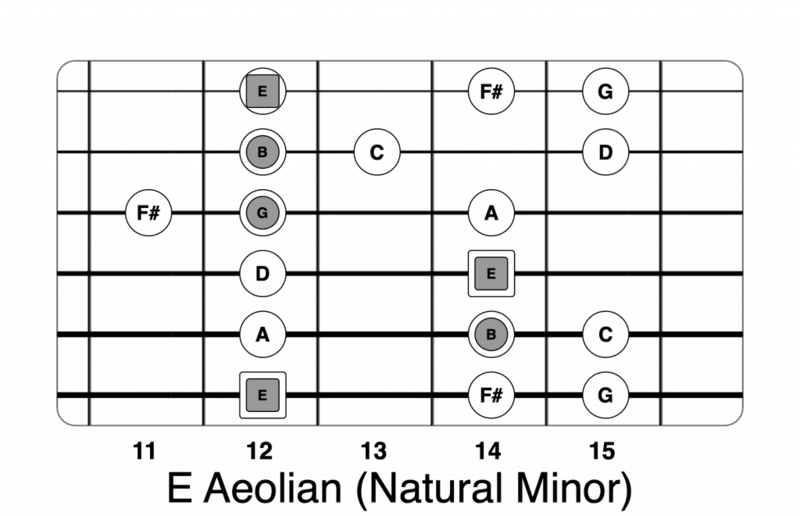 E Aeolian, a.k.a., the E Natural Minor scale and chord. The natural minor scale works great over any minor type chord and any time you want to take some of the “happy” out of your solos. 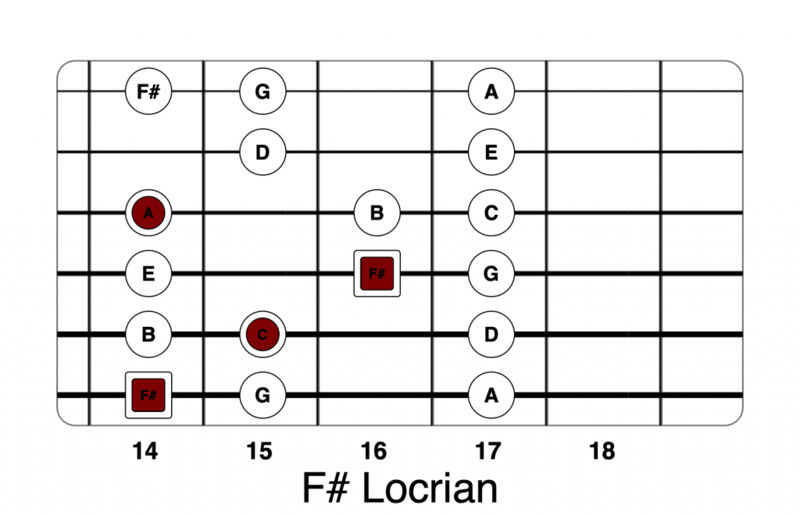 F# Locrian and the diminished chord. Having both a flatted 3rd, 5th and 7th makes for a very exotic and dark sound. Get a FREE 16 Page PDF mini-book of this lesson (and lots of others) in the Guitar Printables area. 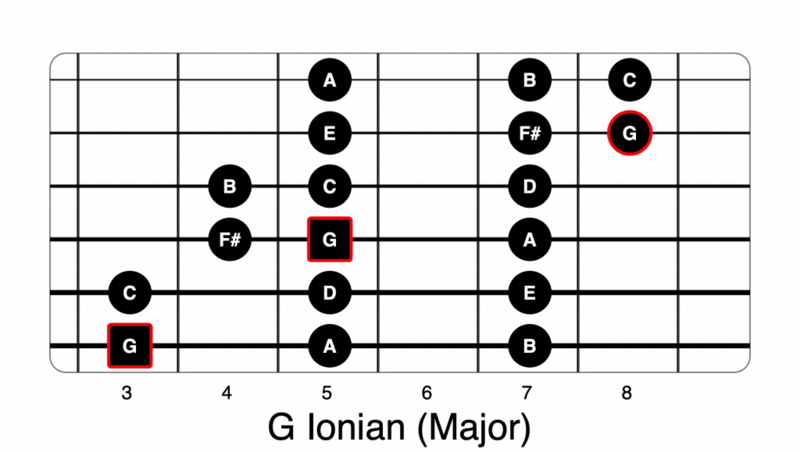 In this common block form, we get all of the notes in the G Major scale twice up to the high A on the 5th fret, E string. Lots more fretboard coverage right? You bet! Not only that, but you get a much easier to memorize symmetrical shape that includes a few extra high notes on the high E string. Don’t be afraid of those 5 fret stretches. They will feel comfortable in no time with a little practice. It came from the 80’s…. …well, maybe not, but it certainly became a thing in the 1980’s post Van Halen era guitar boom. What a boom it was too! Sure, guys like Al Di Meola and John McLaughlin and other Jazz and Classical guitarists had been using shapes like these for years. It just didn’t really catch on in the mainstream… and certainly not Rock guitar, until the early 1980’s. Edward Van Halen along with Randy Rhoads and later Yngwie Malmsteen, ushered forth a new revolution in Rock and Metal guitar pedagogy. Suddenly everyone was getting really, really good. They also were all using some form of a 3-note-per string scale to achieve a higher level of speed and technique than heard previously. That’s not to say, it’s all about speed. Certainly not. Good technique and fretboard knowledge can be a means to an end regardless of whether you want to play “fast” or not. 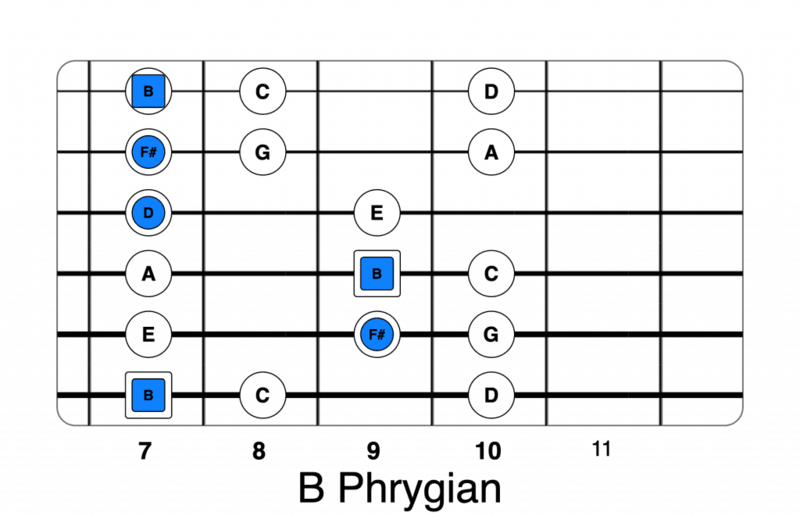 While 3-note-per-string scale shapes certainly make it easier to play faster, they also just cover more of the fretboard and overlap in a way that’s visually easier to digest. Let’s take a look at why that is. G Ionian (green) with A Dorian (black). There are a few interesting and useful patterns to remember (with these shapes) to help you get the whole neck memorized in a key. There are always 3 notes on each string. The next mode always starts on the second note of whatever mode you started with. In this case the “A” note. You’ll always get the first 2 notes of an adjacent mode from the LAST 2 notes of the mode before it. The first 6 notes on the low strings show up again as the same shape in the next mode’s middle string set. The 6 notes on the middle strings show up in the NEXT mode’s 2 highest string set. A Dorian (yellow) and B Phrygian (Black) overlap in the same way! B Phrygian (Blue) and C Lydian (Black). 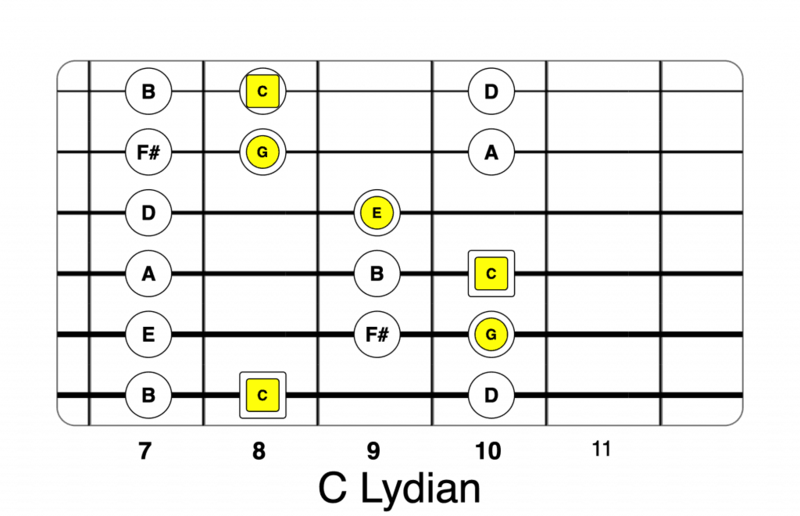 C Lydian (Orange) overlapped with D Mixolydian (Black). D Mixolydian (pink) overlapped by E Aeolian (black). E Aeolian (Black) overlapped by F# Locrian (red). 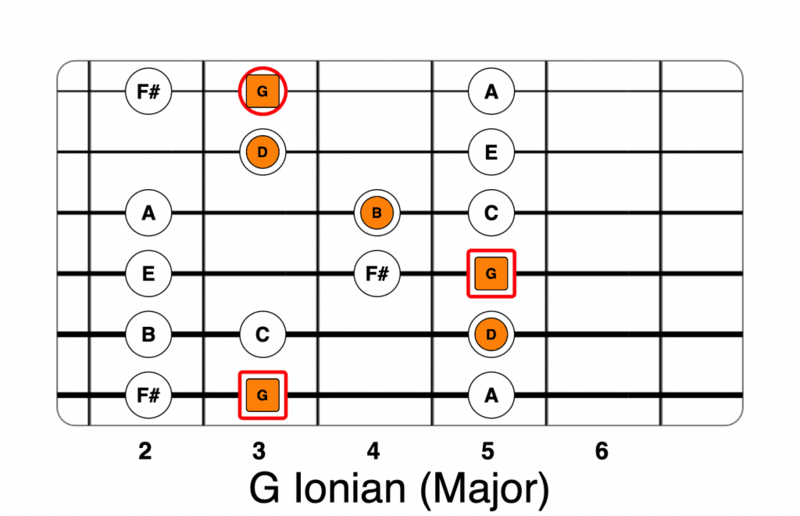 F# Locrian (black) overlapping the G Ionian mode (green). We’re done! You’ve covered the entire neck in modal scales in the key of G Major (E minor). Of course this works in every key and the overlapping works and looks the same regardless of what key you’re playing in. Practice the “up one, down the next” exercise below. Pick 2-3 chords from the block shapes above and create your own song or rhythm. If you can, record yourself. If not, grab an E minor backing track and use it for practice. Go through each pair of overlapping mode patterns and come up with a solo. Improvise! When you feel comfortable with one pair, move on to the next. I recently stumbled upon some amazing new software called GuitarLayers. In fact, I used GuitarLayers for this entire lesson and plan to use it all over my next book! All of the above graphics.. every scale chart… created in GuitarLayers. 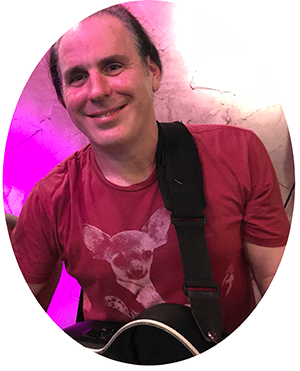 Not only is this a handy tool for someone like me who writes, teaches and runs a website.. it is a fantastic learning tool for guitarists of any level. Lastly, let’s take adjacent modal shapes and make a little exercise to help memorize them all over the neck. Starting in Ionian, play it ascending. After the last note, shift to the last note in the Dorian mode and continue descending. 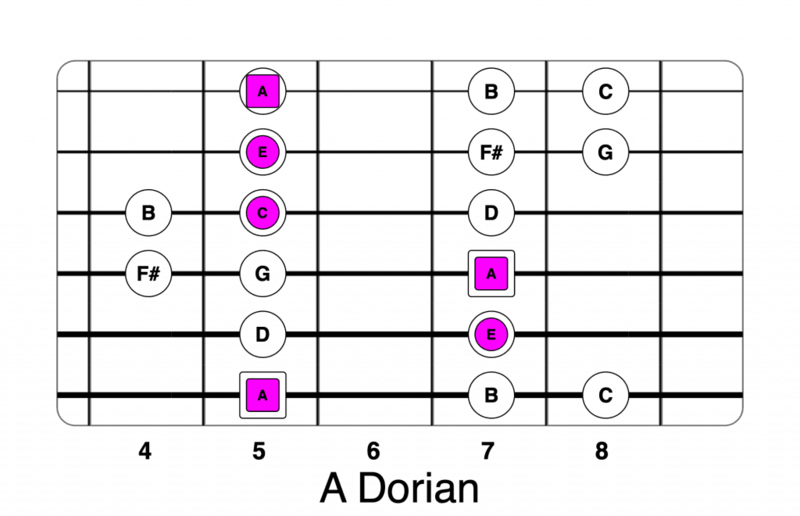 After the first note in Dorian, shift to the first note in Phrygian and do it again. Continue the patterns through all 7 modal scales. Sound confusing? Here it is below in TAB and standard notation. Thanks Ron. I really appreciate that. Glad it helped. Thank you for clarifying and expanding the topic. More than I expected, more fun to delve into. I wrote this one for you Randal.. like I said I get my best ideas from my readers. I appreciate the email and you buying my book. Glad you liked it. I think the email is on a slight delay. I sent it to you. Enjoy! Great article Craig! I’m trying to subscribe to your newsletter but I’m getting an error. I will try again later maybe it’s just a temporary glitch. Sorry about that.. I just checked it its working fine now and have had subscribers join every day.